Quality of Service (QoS) is the capability of a network to provide better service to selected network traffic over various underlying technologies. It differentiates network traffic and prioritizes different traffic flows to provide a degree of guarantee to different networks services, such as voice, video and data. Different applications have different requirements regarding how to handle their traffic in the network. Applications generally require that the network can carry the traffic at the rate at which they generate. Some applications can tolerate traffic delays and jitter and a degree of traffic loss – others cannot. With high-performance Layer 2-3 network test and measurement equipment, Xena offers QoS validation solutions in accordance with RFC 2544 and Y.1564 to enterprises, data centers, network administrators, operators, device vendors, etc. 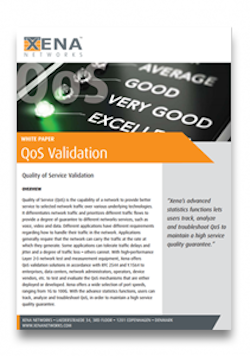 to test and evaluate the QoS mechanisms that are either deployed or developed. Xena offers a wide selection of port speeds, ranging from 1G to 100G. With the advance statistics functions, users can track, analyze and troubleshoot QoS, in order to maintain a high service quality guarantee.